It’s time for another week (week 8!) of Handpicked Songs for Preschoolers. If you’re new to the series, the premise is simple. I’m offering a free weekly music recommendation to you. Anyone who lives with or works with a young child knows what it feels like to hear the same thing on repeat. While you probably can’t eliminate the possibility that you’ll hear a song more than you’d like, this series is an attempt to help expand your musical world in a fun and refreshing way. Stay connected by susbscribing. I’ll send you an e-mail every week so you never miss a recommendation. As a music teacher, I think today’s song is brilliantly educational AND fun. My students love singing and moving along when they hear this song come on. And, I know that they’re also practicing both musical and preschool skills. Playing and then stopping. That’s all that happens in this song, over and over. It promotes active listening and careful body movements. And, it’s just fun. I always over-exaggerate the stopping movement, striking a dramatic pose on the word “stop”. The verses use shaking, ringing, clicking, and tapping. If you have instruments that fit those categories, this is a great song to pull them out on. Or, you can simply shake your body, pretend to ring a bell, snap your fingers or click with your mouth, and tap a body part. 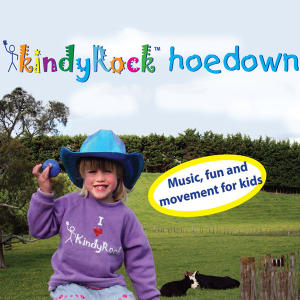 I Can Shake Then I Stop is on the album KindyRock Hoedown. I’m excited for you to hear and try this song from Judi Cranston. She created and runs a preschool music program, KindyRock in New Zealand. Education is a strong priority for the music that KindyRock creates. So, if you like what you hear, take the time to check out more from Judi and the KindyRock crew. Find I Can Shake Then I Stop on itunes. Enjoy your week, and as always, let me know if you have thoughts, questions, or recommendations for me!